RC&E Chill – Industrial Refrigeration and Process Safety / Risk Management – Chill – We Got This! The IIAR has announced the Second (2nd) Public Review of BSR/IIAR 5-201x, Startup of Closed-Circuit Ammonia Refrigeration Systems. This is another “partial” review in that it only shows the changed text in context, not the whole standard. I can already see that the PSM-related section in 5.4.1 is tying itself in knots trying to avoid using the term “review the PHA” like the new IIAR Compliance Guidelines draft will. Your review of these documents – and your subsequent comments – help guide our industry. A second (2nd) public review of draft standard BSR/IIAR 5-201x, Startup of Closed-Circuit Ammonia Refrigeration Systems is now open. The International Institute of Ammonia Refrigeration (IIAR) invites you to make comments on the draft standard. Substantive changes resulting from this public review will also be provided for comment in a future public review if necessary. BSR/IIAR 5-201x, defines the minimum requirements for startup of closed-circuit ammonia refrigeration systems. It presupposes that the persons who use the document have a working knowledge of the functionality of an ammonia refrigeration system(s) and basic ammonia refrigeration practices and principles. This standard is intended for those who startup closed-circuit ammonia refrigeration systems. This standard shall apply only to stationary closed-circuit refrigeration systems utilizing ammonia as the refrigerant. It supplements existing general refrigeration standards issued by IIAR and other organizations such as ASHRAE, ASME, and ANSI. It is not intended to supplant existing safety codes (e.g., model mechanical or fire codes). IIAR has designated the draft standard as BSR/IIAR 5-201x. Upon approval by the ANSI Board of Standards Review, the standard will receive a different name that reflects this approval date. We invite you to participate in the second (2nd) public review of BSR/IIAR 5-201x. IIAR will use the American National Standards Institute (ANSI) procedures to develop evidence of consensus among affected parties. ANSI’s role in the revision process is to establish and enforce standards of openness, balance, due process, and harmonization with other American and International Standards. IIAR is the ANSI-accredited standards developer for BSR/IIAR 5-201x, and is responsible for the technical content of the standard. Thank you for your interest in the public review of BSR/IIAR 5-201x, Startup of Closed-Circuit Ammonia Refrigeration Systems. I had some work performed by a contractor over the weekend. Do I need to fill out any paperwork for that? These situations are humbling for all involved. It’s helpful to remember that Compliance is a goal we are always striving towards. Still, if we’ve been providing this information the same way for YEARS and it’s still not getting through, part of you begins to wonder if there isn’t a better way (cue the infomercials) to establish BASELINE awareness of these requirements. PSM programs have included guidance on ALL these requirements for decades, but it doesn’t seem to be translating into effective action. Perhaps there is another way to jump-start that awareness? In an attempt to do just that, I created a simple little flowchart to give to Operators AND Contractor Service Technicians / Construction personnel. To integrate this into the overall PSM/RMP program, this was placed in the Program Management System Written Plan in the first binder of the PSM program that (in my systems) is entitled “01 – EPA RMP.” The new section is directly after the “Implementation Policy: Management of Program Activities” section. I also referenced this guidance where appropriate throughout the program. In the same Program Management System Written Plan’s “Implementation Policy: Management of Program Activities” section, the text was altered to point to this new guidance. Activities Triggered by a Change: Certain PSM/RMP program activities are triggered when a change is made to the ammonia refrigeration system. See the “Implementation Policy: Management of Contractor / Operator Activities” for informative guidance and then consult the MOC/PSSR Written Plan to manage and track these activities. Activities Triggered by Maintenance to the Systems: Maintenance to the system can trigger other PSM/RMP program policies / procedures. Examples include Lockout/Tagout, Line & Equipment Opening, and Hot Work permit procedures. See the “Implementation Policy: Management of Contractor / Operator Activities” for informative guidance and then consult the Mechanical Integrity Written Plan to manage and track these activities. See the “Implementation Policy: Management of Contractor / Operator Activities” for additional informative guidance concerning operator and contractor work conducted on the system. See the “Implementation Policy: Management of Contractor / Operator Activities” for additional informative guidance concerning contractor work conducted on the system. February 8, 2019 / Brian D. Chapin / Comments Off on Fourth (4th) Public Review of Standard BSR/IIAR 2-2014, Addendum A, Standard for Safe design of Closed-Circuit Ammonia Refrigeration Systems. Re: Fourth (4th) Public Review of Standard BSR/IIAR 2-2014, Addendum A, Standard for Safe design of Closed-Circuit Ammonia Refrigeration Systems. A fourth (4th) public review of draft standard BSR/IIAR 2-2014 Addendum A, Standard for Safe Design of Closed-Circuit Ammonia Refrigeration Systems is now open. The International Institute of Ammonia Refrigeration (IIAR) invites you to make comments on the draft standard. Substantive changes resulting from this public review will also be provided for comment in a future public review if necessary. We invite you to participate in the fourth (4th) public review of BSR/IIAR 2-2014, Addendum A. IIAR will use the American National Standards Institute (ANSI) procedures to develop evidence of consensus among affected parties. ANSI’s role in the revision process is to establish and enforce standards of openness, balance, due process and harmonization with other American and International Standards. IIAR is the ANSI-accredited standards developer for BSR/IIAR 2-2014, Addendum A, and is responsible for the technical content of the standard. The 30-day public review period will be from February 8, 2019 to March 10, 2019. Comments are due no later than March 10, 2019. January 18, 2019 / Brian D. Chapin / Comments Off on OSHA Raising Fines Again! January 15, 2019- The Federal Civil Penalties Inflation Adjustment Act of 1990 as amended by the Federal Civil Penalties Inflation Adjustment Act Improvements Act of 2015 (Inflation Adjustment Act) requires the Department to annually adjust its civil monetary penalty levels for inflation no later than January 15 of each year. Adjustments are made by issuing a final rule that is effective on its date of publication in the Federal Register. Fourth (4th) Public Review of Standard BSR/IIAR 6-201x, Standard for Inspection, Testing, and Maintenance of Closed-Circuit Ammonia Refrigeration Systems. A fourth (4th) public review of draft standard BSR/IIAR 6-201x, Standard for Inspection, Testing, and Maintenance of Closed-Circuit Ammonia Refrigeration Systems is now open. The International Institute of Ammonia Refrigeration (IIAR) invites you to make comments on the draft standard. Substantive changes resulting from this public review will also be provided for comment in a future public review if necessary. BSR/IIAR 6-201x, specifies the minimum requirements for inspection, testing, and maintenance applicable to stationary closed-circuit ammonia refrigeration systems. It presupposes that the persons who use the document have a working knowledge of the functionality of ammonia refrigeration system(s) and basic ammonia refrigeration practices and principles. This standard is intended for those who inspect, test, and maintain stationary closed-circuit ammonia refrigeration systems. This standard shall apply only to stationary closed-circuit refrigeration systems utilizing ammonia as the refrigerant. It supplements existing general refrigeration standards issued by IIAR and other organizations such as ASHRAE, ASME, and ANSI. It is not intended to supplant existing safety codes (e.g., model mechanical or fire codes). IIAR has designated the draft standard as BSR/IIAR 6-201x. Upon approval by the ANSI Board of Standards Review, the standard will receive a different name that reflects this approval date. We invite you to participate in the fourth (4th) public review of BSR/IIAR 6-201x. IIAR will use the American National Standards Institute (ANSI) procedures to develop evidence of consensus among affected parties. ANSI’s role in the revision process is to establish and enforce standards of openness, balance, due process and harmonization with other American and International Standards. IIAR is the ANSI-accredited standards developer for BSR/IIAR 6-201x and is responsible for the technical content of the standard. The 45-day public review period will be from December 7th, 2018 through January 21st, 2019. Comments are due no later than 5:00 pm Eastern Standard Time (EST) on January 21st, 2019. Thank you for your interest in the public review of BSR/IIAR 6-201x, Standard for Inspection, Testing, and Maintenance of Closed-Circuit Ammonia Refrigeration Systems. Please take time to review these changes. As we’ve stated previously, IIAR 6 will be the biggest change to Ammonia Refrigeration practices since the advent of PSM/RMP. Action: Final rule; announcement of effective date. Summary: The Environmental Protection Agency (EPA) is announcing that the amendments to the Risk Management Program under the Clean Air Act put forward in a final rule published in the Federal Register on January 13, 2017 are in effect. Dates: The rule amending 40 CFR part 68, published at 82 FR 4594 (January 13, 2017) and delayed at 82 FR 8499 (January 26, 2017), 82 FR 13968 (March 16, 2017), and 82 FR 27133 (June 14, 2017), is effective December 3, 2018. We’ve been warning about it for a while, but it’s finally happened: The 2017 Obama EPA RMP amendments are now in effect. You need to make changes to your RMP prevention program to be compliant with these changes. First, is a “clean” CFR. That is, a version of the RMP Rule that shows it as we believe it is right now. Note, there are minor errors in the actual RMP rule as filed in the Federal Register, so we’ll update this as the filing is fixed. 38 page “Clean” CFR link (here). We have also created a list of changes – arranged by PSM/RMP element – that need to be made to your RC&E PSM program to become compliant with the updated RMP rule. We’ve created a 10 page PDF with that information (here). Feel free to Contact Us via if you would like assistance from RC&E in updating your PSM/RMP program to comply with these new requirements. 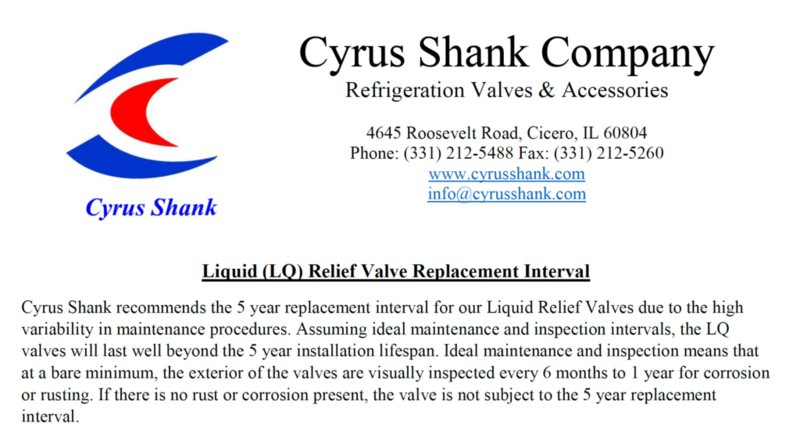 A little over a year ago, our Process Safety Engineer, Josh Latovich, posted an article entitled “The Cyrus Shank LQ Series Relief Valves – A Discussion on Manufacturer’s Recommendations and the 5 Year Pressure Relief Valve Interval.” The article dealt with confusion surrounding dueling RAGAGEP’s for the replacement interval of hydrostatic valves. This means that the manufacturer is onboard with the IIAR’s position on NOT having to replace these valves if they are visually inspected. THAT SAID, you still need to look at the FUNCTION of these valves in your system during your Process Hazard Analysis (PHA) to see if their failure will negatively impact your system. In the way they are NORMALLY used, a failure of these valves would cause efficiency issues, rather than safety ones. But you will need to look at the unique situation you have with them before deciding whether a replacement schedule is appropriate or not. Thanks again to Matt Powell and Cyrus Shank for finally putting this issue to rest. You can download a copy of the letter from them at this link. For a full recap of the issue, you can go to the original article. The IIAR’s Standard 5 Startup of Closed-Circuit Ammonia Refrigeration Systems is often overlooked. They’ve just announced a public review of an updated version of the standard. No changelog was provided, but it looks like a fairly minor 5yr maintenance update at first glance. A first (1st) public review of draft standard BSR/IIAR 5-201x, Startup of Closed-Circuit Ammonia Refrigeration Systems is now open. The International Institute of Ammonia Refrigeration (IIAR) invites you to make comments on the draft standard. Substantive changes resulting from this public review will also be provided for comment in a future public review if necessary. We invite you to participate in the first (1st) public review of BSR/IIAR 5-201x. IIAR will use the American National Standards Institute (ANSI) procedures to develop evidence of consensus among affected parties. ANSI’s role in the revision process is to establish and enforce standards of openness, balance, due process, and harmonization with other American and International Standards. IIAR is the ANSI-accredited standards developer for BSR/IIAR 5-201x, and is responsible for the technical content of the standard. The 45-day public review period will be from October 26th, 2018 through December 10th, 2018. Comments are due no later than 5:00 pm Eastern Standard Time (EST) on December 10th, 2018. 2017 RMP Updates – The end of the road? October 17, 2018 / Brian D. Chapin / Comments Off on 2017 RMP Updates – The end of the road? After all that, the RMP rule as amended at the tail of the Obama administration is now surprisingly in effect, even though it is currently being replaced. That means every RMP facility in the country is suddenly out of compliance. This led the EPA to publish an un-signed, un-dated, Compliance Bulletin at the end of September, 2018. Based on how we read it, that compliance bulletin essentially tells us that the EPA is DONE fighting the delay in the courts. They are going to implement and (to some degree) enforce the Obama-era rule and continue with their new rule-making process which should (eventually) reverse many of these changes. In the interim, we are stuck with an updated, enforceable, RMP rule. This means that there are new/updated EPA RMP requirements that your program needs to be updated to address. Feel free to Contact Us via if you would like assistance from RC&E in updating your program.